Home Tech Talk Programming Rectangular selection or column mode - the best text editor feature ever. I'm writing this page because I've spoken to many fellow co-workers that haven't yet heard of the column mode (or sometimes called rectangular selection...maybe even vertical selection) feature available in many nice text editors. If you don't know what rectangular selection is...and you are a programmer, then get ready for a wonderful tool to put in your toolbox. This information has saved me hours of text editing time. Column-mode in a text editor allows you to select text on a column by column basis not line by line. At first thought this may not seem like such a cool feature... but it is really great. When programming, you often have to add the same information to many lines of code. With column mode, you can quickly make the change on all the lines at the same time. Access keys and methods are a bit different in every editor. First thing to learn in any text editor is the selection capabilities. I would like this page to serve as a teaching tool for how to do column selection in all of my favorite editors (Ultraedit, JEdit, Vim, emacs, VS2008, etc). First on my list is Ultraedit, which is the IDE I first learned about column mode selection goodness. Column-mode editing allows you to select, copy and paste a rectangular block of text. In Ultraedit, you can select a single column (with width=0 characters), start typing and whatever you type is inserted in every line selected. Wow! The visual studio team implemented a zero width selection, multi-line edit and insert, with virtual space box selection/editing (editing in the file where there aren't bytes in the file already). This makes VS2010 a very significant upgrade to me. Woot! Woot! To enable rectangular selection in visual studio just hold down the ALT key while selecting text. I think this is a would-be-great feature of visual studio. However, I don't like that you can't select a zero width column. Forcing you to destroy some part of your input. With zero width column selection, you just start typing in front of your selected text. Here are some other interesting textual selection shortcut keys for visual studio. Edit.CharLeftExtendColumn - SHIFT + ALT + LEFT/RIGHT ARROW - Moves the cursor to the left/right one character, extending the column selection. Edit.GoToBraceExtend - CTRL + SHIFT + ] - Moves the cursor to the next brace, extending the selection. Edit.SelectCurrentWord - CTRL + W - Selects the word containing the insertion point or the word to the right of the cursor. Edit.WordNextExtend - CTRL + SHIFT + RIGHT ARROW - Extends the selection one word to the right. JEdit is a nice cross platform programmer's editor. It is open source java. VIM has the ability to select text in rectangular blocks in VISUAL BLOCK mode. Hit CTRL-V and you can extend the selection column by column. This doesn't allow you to have 0 width selections or to move and extend the selection into columns that do not exist on disk however (huge drawback!). I'm still not sure how to then insert text on each line either. A work in progress... if you know how, please let me know. Thank you Jonathan Lee! - Here's what I know: After selecting a block with Ctrl-v, press I (shift-i) to insert text in front of the block. While you are editing, it will only show the insertion on the first row. Once you are done, press ESC and the insertion will be done on all of the other rows. To append data after a block, press A (shift-a), type in the text you want then press ESC. If you want to insert data at the end of a block of rows, select the rows you want vertically then press $. This will select everything to the right of the column you were on. Now press A (shift-a) as before, enter the text you want then press ESC. Selecting columns with visual block mode - vimcasts.org on column commands and using visual block mode. Columns Plug-in for Eclipse 3.3.1 - this is a pretty nice plugin with many options (shown above). My only gripe with this plugin, is that it doesn't show the selection as-is...it still highlights characters outside of the selection. Though, it is better than nothing and it does what it should. 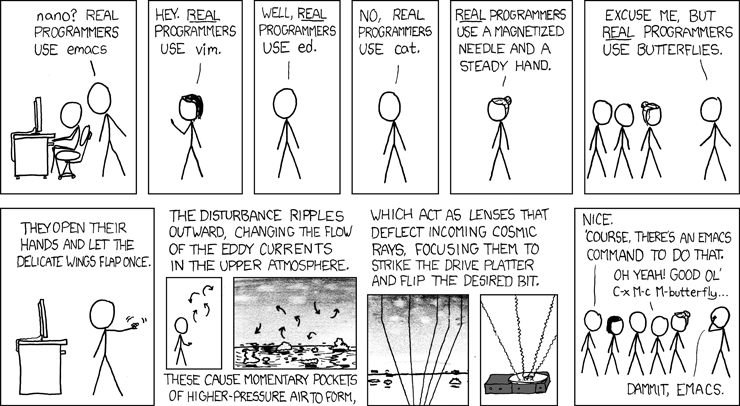 emacs-fu - useful tricks for emacs blog. The Craft of Text Editing - a thesis on text editing. Lucas Vieites writes Hi, I am too a big fan of this feature that is absent from all the "big" programming editors out there. I miss it very much since I had to quit using "Nedit" a few years ago because of it's lack of unicode support. In Nedit you can do Ctrl+drag to select columns and copy/cut & paste them wherever you like. Lucas Vieites also noted geany which I had not seen before...it also includes column mode. Geany : Home Page -a text editor using the GTK2 toolkit with basic features of an integrated development environment. Geany is based on Scintilla and SciTE and is gtk based.